When I first thought about chronicling my experiences in the David Lynch Graduate School of Cinematic Arts at the Maharishi University of Management where I am currently enrolled in their MFA in Screenwriting Program, I bounced between a couple of ideas. Would it be essays on my interpretation of David’s work? (See my articles on Twin Peaks) Would it be a narrative? Would it be a creative handbook, detailing the things I’ve learned? When you do TM, the physiology of the body goes into a state of deep rest and the stress that constricts you just dissolves. For my own experience, it’s like all the negativity in my body sizzles and floats up to my temples and forehead like oil and an invisible hand pulls all that gunk right out of my face. Waves of bliss resonate throughout my nerves like sound and it is the most incredible sensation. But I imagine it’s different for everyone. I personally have a very visceral, very visual dive within almost every time. It’s the most psychedelic thing I’ve ever experienced, but it isn’t like drugs. Drugs distort the nervous system, whereas TM restores it. I do it twice a day for twenty minutes each and come out more refreshed and energized than when I went in. I first became interested in TM as a teenager, when I was obsessed with The Beatles. They learned it in Rishikesh directly from the Maharishi Mahesh Yogi himself—who brought the technique to the West—and it helped the Fab Four write The White Album, their most creative work by a long shot. I wasn’t ready for TM then, but I am now. After reading David Lynch’s book Catching the Big Fish, I became obsessed with learning it. I didn’t just need it, I wanted it. As a musician myself, as a writer, actor, and now as a screenwriter at the David Lynch school, TM and its benefits have changed my entire perspective on art and creativity. As I see it, we have, in the present time, a poverty of art. That’s not to say that there isn’t very much art. Of course, there is a ton of art being produced every day, across every medium, in every culture. Yet, how much of this art is actually contributing to expanding happiness in the world? I’m not talking about the kind of happiness that disposable, endorphin-happy pop culture represents. I’m talking about meaning. How much art out there is being pushed to give people room to find a space within themselves where they can find and make meaning in their lives? How much of modern art is based in the material world, or in the perpetuation of materialism, whether in support of the materialist paradigm or not? The Enlightenment period of the 17th and 18th centuries initially championed science, art, and reasoning for the better, but the socioeconomic systems that sprang from that beautiful period of human progress, for good and for evil—namely capitalism, socialism, communism, and the various forms of technological, cultural, and economic totalitarianism which have popped up over these past centuries—have since then collectively brought our planet and its resources to the very brink of extinction. As a result, world civilization in the 21st century is in a state of perpetual decay. Our art reflects that decay, and it reveals symptoms of a much greater, much deeper problem. A change in perspective is sorely needed. As David explains, the Transcendental Meditation technique is an effortless procedure which allows the excited mind to settle down gradually until the least excited state of mind is reached. This is a state of inner wakefulness with no object of thought or perception, just pure consciousness aware of its own unbounded nature. It is wholeness, aware of itself, devoid of differences, beyond the division of subject and object, a field of all possibilities where all creative potentialities exist together, infinitely correlated, but as of yet unexpressed. It is a state of perfect order, the matrix from which all the laws of nature emerge. It is also non-religious. Anyone from any religious background, even a non-religious background, can practice TM and come away better for it. It does not replace any belief system. If anything, it enhances them. Where this concerns any artist, Transcendental Consciousness is the source of all creative intelligence. It is the wellspring from which every artist catches their ideas. Meditation frees the mind of restrictions and constraints so that ideas can flow like a flood instead of a trickle. I imagine it would be very appealing to someone looking for a cure to writer’s block, if there’s even such a thing. What I think writer’s block is is stress choking up those tubes of the mind where ideas pass through. Stress, negativity, and darkness are writer’s block. The solution isn’t to fight darkness with darkness. The solution is to introduce light, and that light is consciousness. From the consciousness-based view, it is not evolution which spurs consciousness, but the inverse: consciousness guides evolution, and the end goal of that evolution is happiness. Maharishi teaches that there is a “colorless sap” which pervades all things, a lifeblood to everything that exists throughout the cosmos. This is consciousness, but how does it work? Desire is the abstract principle which propels this evolution. As the expansion of one’s happiness is the purpose of life, evolution is the process through which that purpose is fulfilled, and desire is what guides the evolution. For Maharishi, the fulfillment of Dharma is perfection, achieved in higher states of consciousness where individuals are completely awake to the unbounded value of life and state of being. After I learned TM, my writing, my art, and my music all became richer, and creating brought me so much more happiness. Another effect of TM is that it dissolves stress in the body even better than sleep does. An artist can’t be stressed out when they make art. Not totally. There has to be joy in the doing. A work can be dark, but the artist takes great care and focus in crafting that darkness. There is a joy in that which is undeniable. A lot of misguided individuals believe they thrive on their depression and anxieties to give an edge to their art, but they have largely tricked themselves into thinking that. I’ve done this as well. For years, I thought if there weren’t some crisis in my life that I would lose that artistic edge, and looking back now that was completely a bogus way of thinking, and it is bogus for the exact reason that it was based in the materialist worldview. My artistic concerns were rooted in the objective world only and ignored the total reality of what it was that I was doing. I was dependent upon an engine of negativity that I alone was responsible for, to create new terrible situations to give me excuses to make things. That kind of method is unsustainable. The truth is, you already are your edge. The happiness that comes from expanding your consciousness within has no degrading effect on the work in that way. Suffering, anxiety, depression, and all the awful things we cling to as artists remain intact within the work, because they are what make the work real. They’re a part of the world and we, being parts of the world, absorb them; but just because these things will enrich our stories, music, and art does not mean we have to give them permission to lord over our souls and torture us. All of that is within our power. Making art is, in and of itself, a joyful enterprise, and that joy comes from within. Whether or not a work of art is sad or depressing is one thing. The attention any artist gives to their work, that focus is what brings fulfillment to our lives. It doesn’t deplete the edge. It refines it. With TM, that feeling can soak the entire process, like a colorless sap. By finding joy in the doing, one lends their strength to transforming the current impoverished state of art into one of unbounded riches, and thereby contribute to human evolution for the better, away from materialism and towards a paradigm based in the expansion of consciousness, towards an unbounded state of being that could only be good and nurturing for human society at large. I encourage every artist, in every discipline, to look up the many benefits of TM, contact their local TM center, and take the steps necessary to learn the Transcendental Meditation technique. We have a motto at the David Lynch Graduate School of Cinematic Arts: “Meditate and Create!” By utilizing TM as a tool, artists can achieve an inner success that is more rewarding than what material success can offer and share that inner joy with the world. You have to ask yourself the question: Is your art meant to make the world a worse place or a better place? I hope every artist will choose the latter. A very clear survey of the way consciousness feeds art. Many thanks to this writer for covering so many important points. All of this information is very useful to artists, artists have a much greater interest in technique. 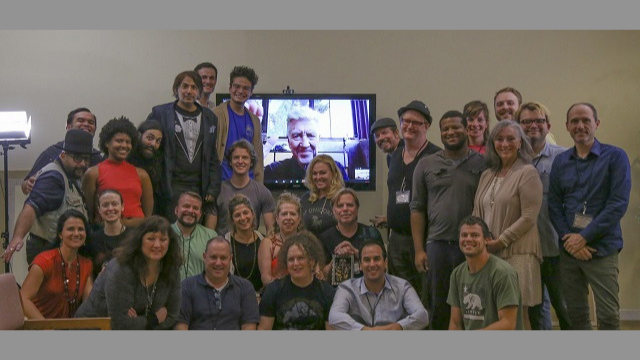 Good luck to all the people in the David Lynch film program at the university.